﻿Individual session might suit you best if you don’t want to expose the secrets of your family . By doing an Individal session first, you will see the respect and compassion that is brought to each family member. Much of the work involves drawing the Family Tree of previous generations who are unlikely to be alive now. The actions of others in your family have significant (and often deeply unconscious) effects on you - even across generations. What happens in a Family Constellation Individual session? After a brief discussion of the issue, you will be asked questions about your family structure and significant historical events experienced by previous generations. We will do a quick meditation to focus on your Family Tree lineage. 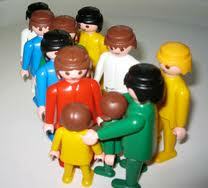 You will then be asked to choose figurines to represent certain family members. You will place them on the desk in a deliberate manner, without over thinking - this is called Family Constellations Set up. From there the practitioner will begin the collaborative and intuitive process. It should be noted that something profound happens here. Looking at your family structure from a distance and watching how things change as the figures are moved invoke deep inner feelings. These are relieved quickly by the use of healing sentences. You will know when the process ends, you will feel it and have the understanding of what you came searching for. Individual Family Constellations session are £ 130 for 90 minutes.